HomeNewsPress ReleasesFor a Perfect Mother’s Day, Give a Manatee! For a Perfect Mother’s Day, Give a Manatee! Diana choose adoptee Lucille for her mom as a Mother’ Day gift. “My mom is not only a grandma, she is a GREAT grandma in both senses of the word,” says Diana. 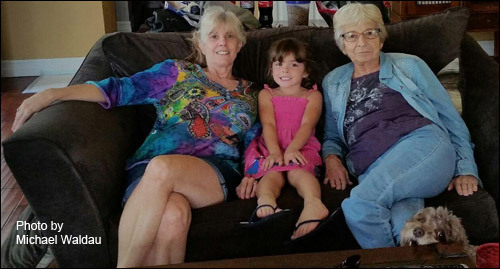 Lucille is a perfect grandma match for my mom.” Featured in photo … Diana on the left, her granddaughter Jacquelyn, and her mom, Doris. Note:A high resolution jpeg (300 dpi) of a manatee image, a photo of Diana Waldau and family, and a photo of the handmade collectible manatee ornament, are available upon request. Mom deserves something special and thoughtful on Mother’s Day. Adopt-A-Manatee® from Save the Manatee Club! For $25, the Club will send an adoption certificate, photo, and known history of a real living manatee. Adopt at $35 or more and receive a free handmade collectible manatee ornament (while supplies last). Choose from 34 real Florida manatees, including manatee moms Annie, Aqua, Phyllis, and Lucille. View them all by visiting the Club’s website at savethemanatee.org/adoptees or click the following link to Adopt-A-Manatee® online now. Funds are used to help protect manatees and their habitat. Show your love for Mom with a manatee adoption. 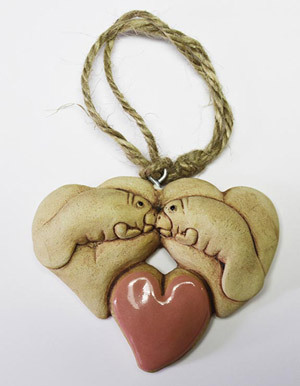 An individually handcrafted manatee heart ornament is included with every gift adoption of $35 or more (supplied are limited). Save the Manatee Club, an international nonprofit 501(c) (3) manatee conservation organization, has been the voice for manatees since 1981. The Club was co-founded by renowned singer/songwriter, Jimmy Buffett, and former U.S. Senator, Bob Graham, when he was governor of Florida. Funds from the adoption program help with the Club’s goals to reduce manatee harassment, injuries and deaths from human activity; to protect ample healthy habitat to support a stable or growing manatee population; and to ensure that sufficient conservation measures have been adopted to protect individual manatees from life threatening injuries. For more information about manatees and adopting for Mother’s Day, visit Save the Manatee Club’s web site, or call 1-800-432-JOIN (5646). Also, visit The Manatee Store, the Club’s online shopping center, for more appealing gift ideas at shopsavethemanatee.org. Watch manatee webcams and see recent video at ManaTV.org. You can also follow the Club on Facebook, Twitter, Pinterest, and Instagram. Watch manatee videos on YouTube.